You most probably know him as the author of the children’s fairy story, 'The Princess and the Goblin'. 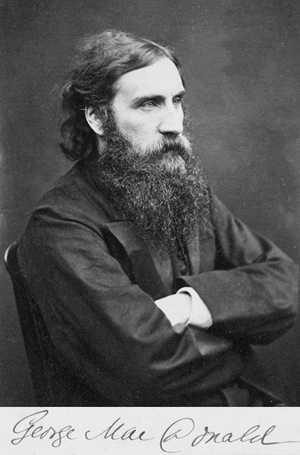 His name is George MacDonald. But I’d be willing to guess that you are largely unaware of how utterly fascinating a character he was. If there were gold medals for 'interesting' this sombre pastor, poet and writer of fantasy fiction - a man with a beard like a buzzard's nest - would sweep the board. Born in Huntly, Scotland, he authored fifty-one titles, books and sermons. He was married for over 50 years and fathered 11 children. MacDonald had an impressive intellect. He occasionally wrote in scots dialect, but he could read Dutch, English, French, German, Greek, Italian, Latin, and Spanish. Amazingly well connected in literary circles, he was a friend of Mark Twain, the author and the poets Longfellow and Walt Whitman. Lewis Carroll, the author of Alice in Wonderland was mentored by MacDonald. His written works of fantasy which included in addition to the childrens fantasy novel The Princess and the Goblin, The Princess and Curdie, Lilith and At the Back of the North Wind influenced the greatest fantasy writers of his time including Lord of the Rings author, J.R.R. Tolkien and C.S. Lewis, best known for The Chronicles of Narnia. This was not a man who wore life like a loose garment. Some of his quotes were dour enough to curdle cheese. Here's a for instance: "With the heathen, the time of trial does not cease at their death." Not exactly a cocktail party ice breaker, is it. If you Google his name you will be presented with half a dozen photographs of the man. Not one has even the hint of a smile. Maybe he had little to smile about. There was more than a hint of eccentricity about him too. A critic writing in the New Zealand Art Monthly said of MacDonald’s stories that they were normal fairy tales which slowly became stranger as he added layers of symbolism to the narrative. This symbolism came as no surprise to religious scholars because Macdonald held Christian Universalist views. In this take on the spiritual world, sin was punishable in the afterlife but the punishment itself was finite in nature. According to the lights of this doctrine, a sinner might spend a thousand years in the fiery pit, with sulphurous fumes frazzling his nostril hair and flames constantly licking at the waistband of his Knickerbockers, but when it was over it was over. Anyone worrying about eternal damnation could do worse than throw their arms around this religion. In another quote, Macdonald seems to have a premonition of the current prime-time programming output: "You cannot live on entertainment," he said. "It is froth on the water - an inch deep and then the mud." In 1899 he suffered a stroke that left him unable to speak for the next six years. He died in 1905, three years after his beloved wife, after a lifetime plagued by poor health in general and consumption in particular.